Copying from a purchased template or a clone of a purchased template to a non-purchased template is restricted. Pasting a global group inside another is not allowed. Email coding is very different than coding for web, so copying from a page template to an email template (and vice versa) is not allowed. Blog templates have special HubL tokens so what you copy from a blog template can only be pasted in another blog template. In fact, blog templates may be pretty complex, so we don't recommend using the extension to copy/paste in blog templates at all. Why doesn't work copying from purchased templates to non-purchased templates? To protect intellectual property of developers, the extension doesn't allow copying from a purchased template or a clone of a purchased template to a non-purchased template. 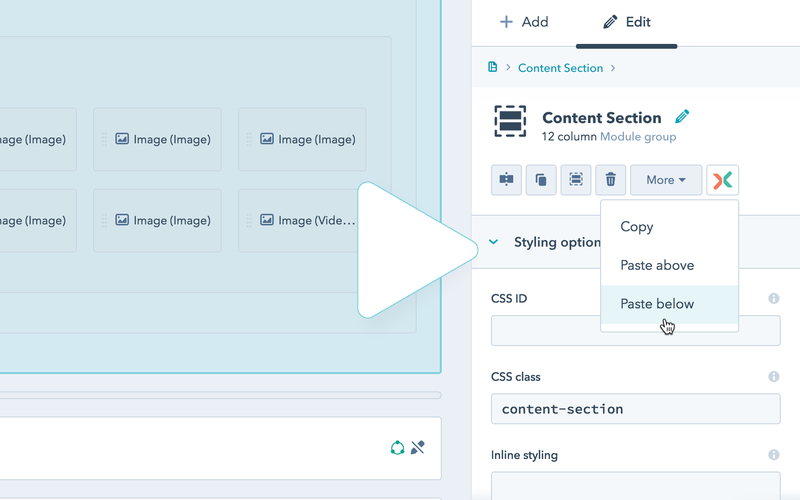 You can however clone a purchased template and remove all the other existing sections if you want to start clean, where you can paste your section. HubSpot doesn't allow copying a purchased template or a copy of a purchased template to another portal, most likely for the same reason. This is not an official HubSpot extension and most of the API we used in the extension is not public or officially documented. To make it functional, we applied workarounds that may stop working if changes are made in the HubSpot API or source code. This is a free Chrome extension, provided AS IS, and not to be included or related to any other product we sell on the HubSpot Marketplace. We do not take any responsibility and we are not liable for any damage caused through use of this extension, be it indirect, special, incidental or consequential damages.